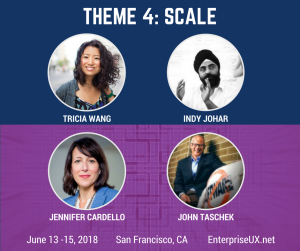 Our SCALE theme, one of Enterprise UX’s four “mini-conferences,” focuses the biggest differentiator in enterprise UX work. We face scalability challenges at every corner, from having the most impact with limited resources to scaling up design capacity, managing distributed teams, or understanding customer journeys in overwhelmingly complex environments. Above all else, we face the challenge of remaining customer-centric as we navigate matrixed organizations, functional silos, and hierarchical reporting structures. How might we create space for deep user research while managing to scale up our products? How do you get org leaders on board to help scale UX design in the enterprise? Join us at Enterprise UX 2018 where these four experts will share how they’ve tackled scaling UX design across multiple offices and hierarchical organizations. Get a taste of what we’ll cover in this short podcast interview with Tricia Wang—or just go ahead and register for Enterprise UX.